Definitely steep this leaf a second time if the first steeping is on the short side of our suggestion. This leaf is extremely large so if you are measuring by volume be sure to use a generous amount. The volume quantity of it by weight yields a particularly large quantity of leaf so keep that in mind when measuring! 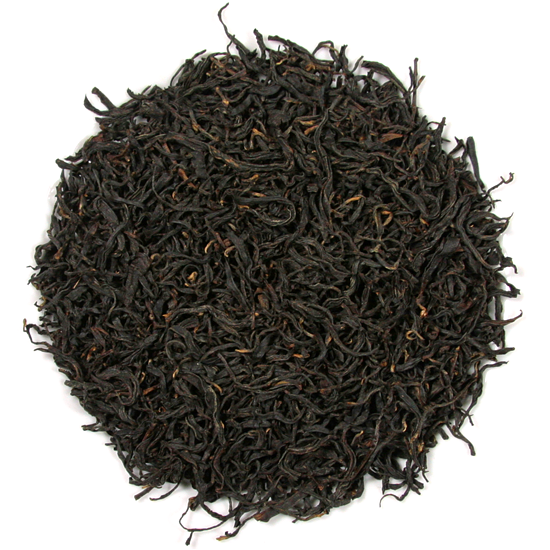 Here at Tea Trekker we have become cheerleaders for the dian hong from Yunnan Province: leaf grown and manufactured into delicious black tea in a beautifully diverse and tea-friendly region in the southwest of China. This wild arbor dian hong is from JingMaiShan, a mountain region located in the southern part of the Simao Prefecture – a region known to Pu-erh lovers as a remote, mountainous place that produces high-grade fresh leaf from indigenous tea bush cultivars, which is then turned into fantastic tea. Whether harvested from old plantings or new, the leaf from this region has special taste qualities that yield delicious types of both Pu-erh and dian hong/hong cha. 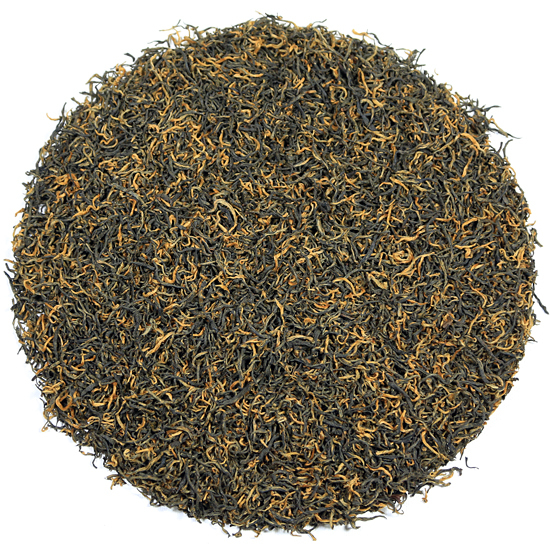 JingMai Wild Arbor tea has some red-fruit undertones of an eastern China black tea – it is very complex, aromatic, and has a clean, dry, and austere style. It has the straight-forward crispness of some eastern China hong cha (such as Lao Zhong, Zheng Shan Xiao Zhong, or Bai Lin) but with more softness and a booming aromatic (especially in the dry leaf) and a large amount of ‘returning flavor’. 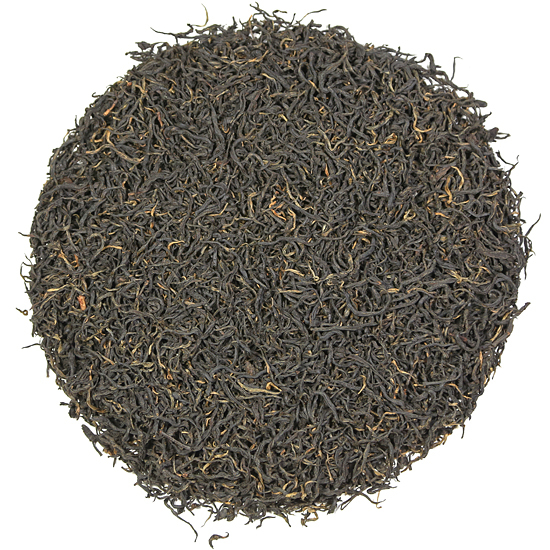 There are some caramel notes that typify Yunnan black tea and also a touch of a spicy, cacao/cinnamon styling that show a well-controlled and modest oxidation. The leaf is very long and elegant, wiry and slender and there is little tip in the leaf. The leaf is primarily a dark-charcoal color with a matte finish due to a modest firing. It is similar to both the AiLao and Yi Mei Ren in its having a dry, austere style, but it is more complex than either. The tea bushes that provide this leaf are among the indigenous, heirloom varietals from Yunnan Province that we find so tasty. The body/mouth-feel is modest yet is more than offset by the completely intoxicating flavor components. These are tobacco, cacao/dark chocolate, and ripe red fruits – and are abundant. The ‘returning flavor’ is also abundant, one of the most lingering aftertastes that we have tasted in some time. 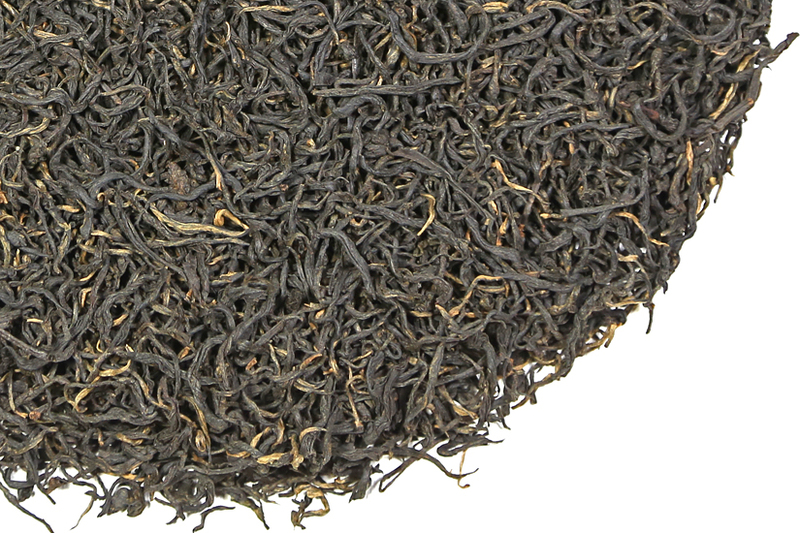 The dry leaf has a booming aromatic that is delightful and creates much anticipation. This aroma does not make much of an appearance in the first steeping, however, if you re-steep the leaf the aroma releases into the second cup. The color of the tea liquor is a deep claret – beautiful in a white cup or china mug. Our JingMai Wild Arbor tea is on the one hand typical of a classic Yunnan black, but we think that this Wild Arbor pluck is also more interesting on the complexity scale. If you appreciate the Wu Yi rock oolongs such as Rou Gui, with its spicy, cinnamon-dry finish then you will love this tea. Make no mistake, this tea is full-bodied and very complex in the top-notes – it will be accommodating to most any preparation and style of serving. But if you want to enjoy the classic dian hong Yunnan caramel-honeyed flavor that other of our Yunnan selections offer, then this is not the tea for you. However, if you are interested in stretching a little and trying a tea that is a bit more unique, this tea is it. As with many Yunnan black teas, this tea re-steeps very well with fresh water (depending on the length of time of the first steeping) and the aromatic qualities of a second steeping are well worth the effort! Prefer JingMai sheng Pu-erh? 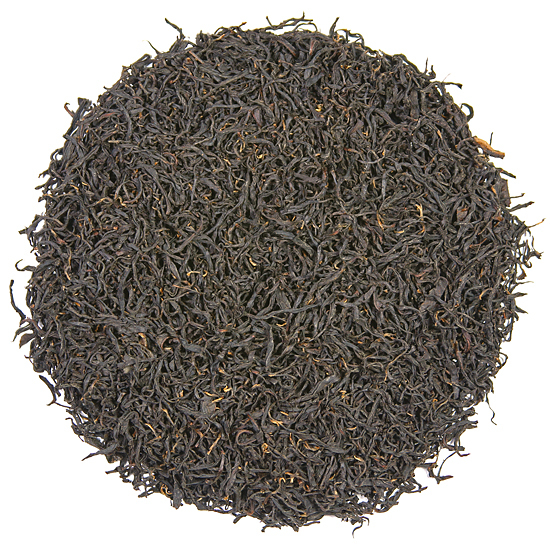 Please see our Loose-leaf JingMai Purple Leaf Sheng Pu-erh .